As a young girl growing up in Scandinavia, New York-based illustrator Johanna Kindvall always looked forward to Friday, when she'd come home from school to the scent of freshly baked cinnamon buns. Her mother baked a batch every other week for fika, the twice daily Swedish coffee break. This custom, in which small groups of friends and co-workers gather over mugs of steaming coffee or tea and an assortment of small buttery cookies and sweet buns laced with warming spices, is a sacrosanct break time for Swedes. It's also the coziest Nordic tradition yet to make the jump across the ocean. First referenced in 1913, the word fika is reversed syllables, a form of slang, of the Swedish word for coffee, kaf-fe, and can be used as either a verb or a noun. Before King Gustav III banned coffee in Sweden in the 1700s, worried small gatherings would foment anti-monarchist rebels, it was originally sold only by pharmacies and only to men. "It was a fuel for revolution, and the church saw it as very sinful," says Anna Brones, who, along with Kindvall, co-authored Fika: The Art of the Swedish Coffee Break. 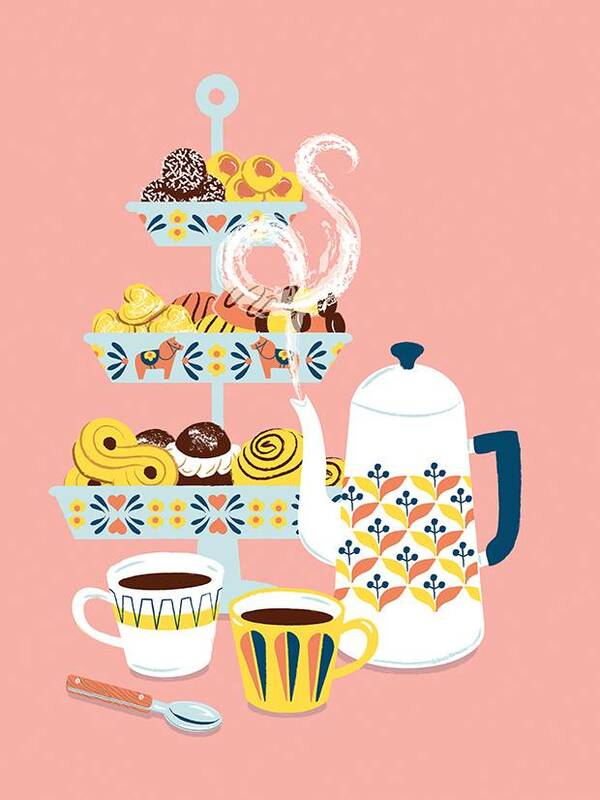 Throughout the early 1900s, it became common for women to host fika gatherings in their homes, primarily for other "classy ladies," as Brones says. "The seven types of cookies come from an old tradition of gatherings for birthdays, funerals or baptisms," says Kindvall. "It's like a smorgasbord of cookies and cakes. If you didn't have more than seven types of cookies, you'd seem cheap." These days, she says it doesn't need to be elaborate and doesn't require snacks to be a true fika. On days she and her husband work from home, they try to take two quick breaks in the mid-morning and mid-afternoon, occasionally sipping coffee on their front stoop, away from their desks. Unlike the cozy Danish concept of hygge and its knit-sweater, roaring-fireplace lifestyle aesthetic that leapt across the Atlantic with a vengeance last year, incessantly busy North Americans haven't embraced fika as quickly. In a culture of grab-and-go coffees and #saddesklunch, caffeine is treated as a stimulant, a drug designed to combat a mid-afternoon slump. In Sweden, fika is the opposite: a slowing-down, an opportunity to find mindfulness and breezy sociability in an otherwise manic day. And academics and expats living in North America say if more people slowed down to smell the coffee, it could benefit our collective happiness and productivity. The concept is gradually finding purchase in North America. In 2006, Swedish entrepreneur Lars Åkerlund opened his first Fika café in New York City, which has since expanded to a dozen branches throughout Manhattan. In Toronto, Kensington Market's Fika Café displays delicate rosewater-ginger sugar cookies, shaped in the café's distinctive toy-horse logo, alongside cinnamon buns, caramel, sea salt and lavender brownies and a menu of open-faced sandwiches. Opened four years ago by Toronto restaurateurs Nikki Leigh McKean and Victor Barry, and since sold to pastry chef Yadi Arifin and his partner, the friendly teal storefront is an oasis of Scandinavian-inspired design. Behind students huddled over textbooks at the café's communal table, dozens of pocket novels screwed to the wall reveal weathered bellies. Lush succulents and that friendly horse motif are sprinkled throughout. From May to October the café hosts "no wifi weekends" aimed at creating a more sociable setting, says Arifin, and a local potter makes the heavy white ceramic mugs. A full-time baker also makes Swedish holiday specialties in season, including semlor, cardamom buns stuffed with almond paste, jam and whipped cream, as well as fruitcake. Viveka Adelswärd studied Swedish culture and customs over a three-decade career as a communications professor at Sweden's Linköping University. She says Nordic countries consume more coffee per person than any other country, with Finland's per-capita consumption in excess of 10 kilograms per year, closely followed by Norway, Sweden and Denmark. "In the beginning, fika meant just a coffee break, but now people in daycare centres and other places where drinking coffee would be considered odd still take fika breaks – a glass of juice, a banana or just about anything in combination with a break and some small talk," says Adelswärd. In a world where status and wealth often dominate social interactions, there's something pleasingly revolutionary about fika. The chance for a CEO to get to know an intern, or for two strangers to connect before declaring the outing a date, elevates this act from just fulfilling a dietary craving to satisfying something more primal. "Some companies think that this habit is a waste of time and have tried to make their employees take individual coffee breaks," says Adelswärd. But, she says, microeconomics research suggests that this hurts group communication and overall productivity in the workplace. Whether taking a break from morning chores or a giant spreadsheet, fika offers those partaking a chance to switch gears, refocus, grab a little nibble and breathe. Not everyone in Sweden enjoys the ritual, however. According to Adelswärd, some people feel ostracized by the social pressure to fika in groups. In one case he explains how a man with Asperger's syndrome hated fika because he found small talk difficult, and in another a childless woman struggled with listening to her female co-workers talking about their kids. Still, Brones says much of the stress and burnout plaguing modern society could be fixed with the pause fika offers. "We're looking for lifestyle solutions, quick fixes to bring us more happiness and balance," she says. Here, fika is a good – and affordable – candidate. After all, it only demands 10 minutes and the self-control required to disconnect from work or errands. "We've become very poor at truly connecting and engaging with people in real life," says Brones. "We have a tendency to get a cup of coffee and then sit in front of our computers, continuing to work. Instead, just take five minutes to sit with a cup of coffee, flip through a magazine." Over the holiday season, during the four Sundays of Advent, many Swedes practice a festive weekend fika called Adventskaffee, says Brones, during which groups of families and friends drink glögg (a spiced, mulled wine) and eat special cookies and cakes. Fika offers comfort and camaraderie during a chilly Swedish winter, which is something she says Canadians can relate to. Adelswärd agrees. "Maybe the cold climate makes us long all the more for the warm company of others."